This study confuses patent quality with invention quality, Science and technology: falling patent quality hits innovation, says OECD. The report makes sweeping statements about the decline in patent quality over the last two decades and suggests this is because of the rush to file patents on every minor improvement. . I can receive a high quality patent for a minor (non-ground breaking) invention. The two questions are unconnected. If the study has any meaning, it is about whether the world is creating revolutionary or disruptive inventions- not about the quality of the patents being issued. If the report had clearly stated that they are concerned with a general lack of innovation, I would agree with this point. After all, I wrote a book about this, The Decline and Fall of the American Entrepreneur: How Little Known Laws and Regulations. I show that the reasons why we are falling behind technologically are because we have weakened our patent laws and because of laws like Sarbanes Oxley. Weakening our patent system makes it harder for inventors with revolutionary or disruptive technologies to raise capital and increases the risk to investors. Sarbanes Oxley makes it almost impossible to go public in the United States, which increases the time necessary to obtain a return when investing in technology startups. Startups are the source of most new revolutionary technologies according to the SBA. Because this report is going to be trumpeted by anti-patent crusaders, I will address the patent quality issue. The video on the report states that OECD has come up with a “new” way to measure patent quality, but neither the video or the text explains the methodology clearly. By reviewing multiple articles it appears that their methodology quantifies patent citations and looks only at the top 1% of patents by the number of citations for that patent. It appears that there are fewer citations for the top 1% of patents than the previous decade. From this, they conclude that there is a 20% overall drop in quality. I assume this means there are 20% fewer citations for the top 1% of patents. First of all, patent citations do not measure patent quality; but they may measure the importance of an invention. Patents are cited in later patents for a variety of reasons. I know many large companies purposely cite their own patents to inflate these numbers even when the earlier patents have little or nothing to do with the present patent application. Second, by only looking at the top 1% of patents the study has arbitrarily defined its population. Is there any justification for this population? Can they show that this population is a good indicator of patent quality or subsequent technological progress? Did they look at a representative group of these patents’ file histories and claims? Third, this could be an indicator that there is no dominate technology driving the economy. In the 1990s, the economy was driven by the internet and most new technology was revolving around this phenomena. As a result, it is likely that you would have more patents citing each other. Fourth, does this study take into account the global economic decline that started in 2000? There is no one metric that can probably capture patent quality, however I have looked at a number of metrics and they do not support the OECD conclusion. I measure my metrics over a longer timeframe, the metrics have broader measures, showing the trend relating to patent quality over the long term has increased. has increased from around $1.2 Million per patent to around $4 Million per patent. The chart shows the total amount of money spent on R&D by the U.S., according to the National Science Foundation, and the number of patents issued to U.S. inventors per year,according to the U.S. Patent and Trademark Office. One potential limitation to the data is that the amount of money spent on R&D is probably representative of large corporations. Small entrepreneurial start-ups are less likely to be accurately recorded in these surveys. This may account for part of the downward trend between 1985 and 2000. How does this compare to other research? 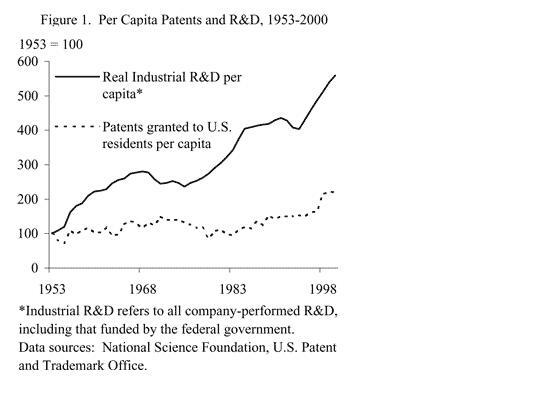 According to a paper by the Federal Research Bank of San Francisco, real industrial R&D has been growing at 3.7% per year between 1953 and 2000, while the number of patents per capita has been growing at 1.7% per year over the same period. See the chart below. 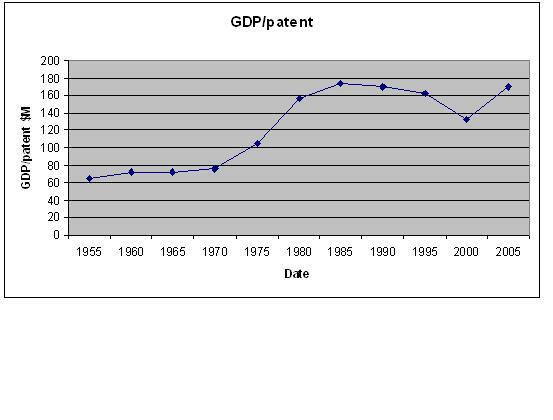 Another patent quality metric is the GDP per patent ratio. An increasing amount of GDP per patent should indicate that the quality of patents is increasing, since the number of patents for a given amount of economic activity is decreasing. The chart below shows that this is indeed the case. last 60 years. Note: the chart used GDP in chained 2005 dollars from the Department of Commerce. The amount of R&D per issued US patent has increased fourfold , or 3.7% per year over the last 50 years. The number of citations per patent increased 3.3% per year over the 25 year period form 1975-1999. These metrics suggest that the quality of patents issued by the USPTO (United States Patent and Trademark Office) have increased over the last 50 years, contrary to the results reported by other researchers. In addition, the critics of US patent quality have selected to compare the US patent system to Europe’s and Japan’s, both of which have proven hostile to small entities. Since small entities are key to the US’s technology innovation, it would be folly to compare our system to theirs. Here is another post, Patent Quality Myth, on point. Science and technology: falling patent quality hits innovation, says OECD. Anthony Brietzman and Diana Hicks, “An Analysis of Small Business Patents by Industry and Firm Size”, Small Business Research Summary, No 335, November 2008. Note that if true the AIA will just make this trend worse, since the AIA effectively eliminates the one year grace period. This means inventors will have to rush to file before they have had time to perfect their inventions. In addition, the most innovative group of inventors are individuals and startups which are disadvantaged by the AIA and therefore will file fewer patents. Note that the R&D per patent chart uses total R&D expenditures while the FRBSF chart uses Industrial R&D.